Donny and Kari Claxton at Yosemite. 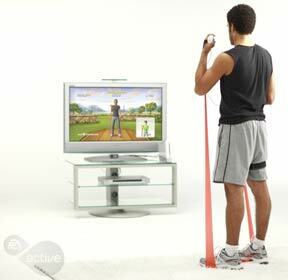 We recently announced a new fitness game for the Wii, EA SPORTS Active, releasing in May. As part of that product launch, EA has partnered with Bob Greene, Alison Sweeney and a few other gamers and bloggers, including Donny and Kari Claxton. They will join a 30-day challenge, beginning with a retreat with the aforementioned celebs in California, and then have 30 days to use the EA SPORTS Active and journal their experience. We invited Donny and Kari to share their thoughts prior to starting the challenge, and they’ll join us again at the completion. Good luck Donny and Kari! Fans of Biggest Loser watching the current season seven might be a little confused by a very noticeably pregnant Alison Sweeney when they learn that she’s got a two-month-old baby girl at home. Sweeney announced her pregnancy during late filming of season six, and was pregnant throughout the filming of season seven. People were surprised to see her six weeks shy of delivery at the season six finale, only to show up a few weeks later on the season seven premiere with a barely-there bump.